Have you taken advantage of our newly instated customer referral offer? If not, you are missing out! 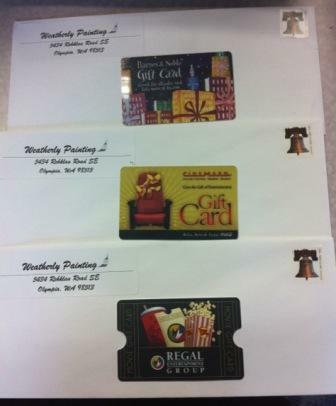 Today our office staff complied gift cards, addressed envelopes and mailed off our first round of referral gift cards. Loyal customers Tammy and Mark chose Regal Cinemas as their FREE $50 gift card while repeat customer Pat chose her FREE $50 gift card to be spent at Barnes and Nobel gift. First time customers Pam and Dave also thought movie night with Cinamax would be a great way to spend their FREE $50 gift card. While all these individuals were all previous customers of Weatherly painting our newly instated Customer Referral Offer doesn’t just apply to previous customers. Anyone who refers Weatherly Painting to a friend will receive a FREE $50 gift card to any store of their choice once the referred project has been completed. Where would you chose to spend your free $50 gift card!?!? Why Neighbors Make AWESOME customers! This week I finished a painting project for a neighbor who lives just down the road. I always think it’s a great compliment when neighbors call me for a free estimate. While I am not always guaranteed to get the job just because they are my neighbor it’s still great to know that they value including me in their painting process. 1. It’s great to be able to ‘see’ the customers and their friends and family enjoy the work that my staff produced. 2. When neighbors get to experience the quality work Weatherly Painting has to offer they are more likely to refer friends and family members based on the quality of work and their personal connection to the business. 3. Neighbors have the opportunity to see the personal side of my business which includes my wife, two young daughters and two pups. This visual reiterates that Weatherly Painting is a family-owned and operated business. 4. Providing quality work to customers established a long-term friendly relationship. This is no different with neighboring customers. 5. A smile and a friendly wave may be just surface deep between other neighbors but neighbors who are past customers are a delight to see. So, as I close-out the current painting project I can’t help but hope that other neighbors soon come-a-knocking-at-my-door based on the referral of my current neighbor. And, as I close this blog I can’t help but say it once again…neighbors make AWESOME customers! At the beginning of last week Weatherly Painting launched our business page on the social networking platform Facebook. While our primary original goal was simply to gain a few-to-moderate fans we quickly realized the business page took on a life of its own. It’s truly amazing how powerful word-of-mouth networking can be in a technologically-savvy era. By simply asking others to ‘spread the word’ our campaign to establish Weatherly Painting as an official recognized business on Facebook grew and grew. One week later our fans have increased by over 90 percent! And now, Weatherly Painting is a mere 5 fans away from being established as a legitimate business on Facebook! What a fantastic feat! We are currently in the works of planning to ‘give back’ to our fans and our community once we have achieved the 100 fan milestone. In the meantime Weatherly Painting hopes to continue to build a strong Facebook fan base as well as utilize other social networking mediums such as Twitter and, of course, our WordPress blog. Got an idea for us? Your comments and suggestions are always welcomed! Email us at: Weatherly_Painting@yahoo.com or view our website at: www.weatherlypainting.com. This post is dedicated to providing our customers with the most information possible to make an informed decision when selecting the best qualified company to hire for their painting needs. It is easy for any company (both large and small) to add a slogan on their website that says something to the effect of: outstanding quality, low prices, professional staff and satisfaction always guaranteed. However, more often then not, their ‘outstanding quality’ is loosing translated from I think I might know how to paint, their ‘low prices’ are employees working under the table or illegally. Their ‘professional staff’ really means I’m going to allow my employees to smoke on the job, arrive late and leave early. And, of course ‘satisfaction guaranteed’ only lasts until your check is cash. Well, this is just simply not the case with Weatherly Painting. Review our company’s qualifications below and make the decision for yourself. 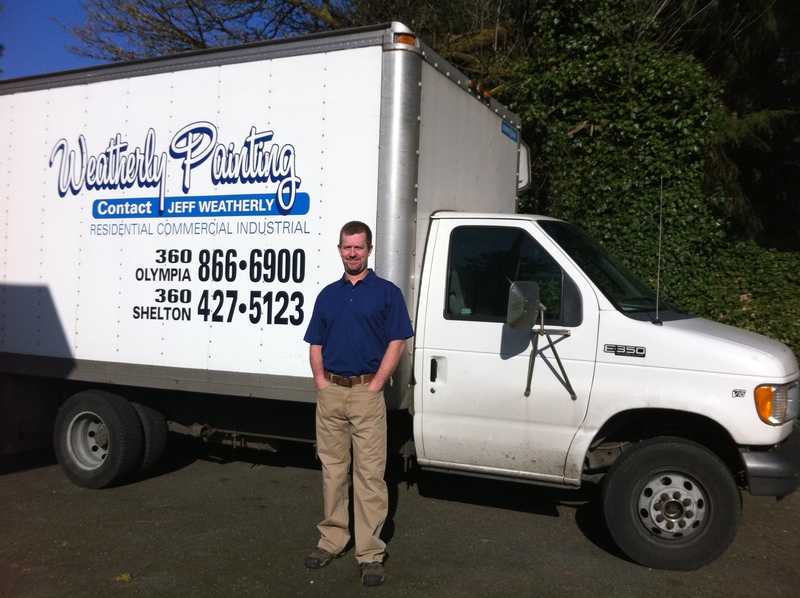 Jeff has been painting for over 17 years in Mason andThurstonCountyand surrounding areas. He established Weatherly Painting in 1999 after working for another local painting company. When Jeff started Weatherly Painting his primary goals were: to provide outstanding craftsmanship at a fair price and to provide customers with the best possible painting experience from start to finish. Prior to Jeff’s painting career he served in the United States Navy from 1986 to 1990. Where he was a Petty Officer 2and was station on aboard SES 200 during the Gulf War. This military experience provided Jeff with the discipline and structure to effectively cultivate and grow his own business. Jeff’s pride in his work is evident and his dedication to providing a quality product has gained Weatherly Painting many loyal repeat customers. Jeff’s current projects include the development of a portable Portfolio of Work that will showcase the painting jobs completed during the 2011 painting season. Rishel joined Weatherly Painting in 2005 as co-owner. Her primary responsibilities include public and non-profit contract development, marketing, website and social media development. Rishel also manages the company’s business structure, taxes, payroll and general day-to-day office operations. Rishel has a bachelor’s degree in business, a master’s degree in public administration and nearly 10 years public service experience. Rishel’s current projects include the revitalization of the company’s website, development of a Weatherly Painting Fan Page on Facebook-which at the time of this blog is only 9 fans shy of obtaining the idolized 100 fan mark that establishes Weatherly Painting as an official business to the Facebook community- and development of the Weatherly Painting blog. Rishel also hopes to begin a quarterly newsletter and always welcomes comments and suggestions. Weatherly Painting takes great pride in the quality, timelessness and professionalism of our painting crew. Each member of our painting staff is hand selected to provide our customers with the best results. In our strive for excellence we put the safety of our staff first. 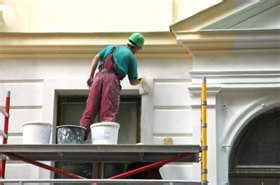 Weatherly painting ensures that all employees are fully trained and prepared to work in the painting field whether it be on small residential homes are large commercial buildings. Our employees are fully trained to use everything from respirators and certified ladders to suspended work platforms and more. At Weatherly Painting our office staff, painting staff, customers and even our furry four-legged friends are treated as family! 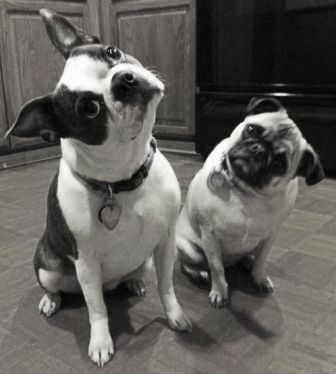 Clara Claire Lemonade, a brindle colored Boston Terrier, has been with Weatherly Painting for about four years. Bella Bee Bug, a fawn colored Pug, has been on staff for almost a year. These girls work hard at providing a positive attitude within the company. Their daily duties consist of greeting office and painting staff as they arrive in the morning, scattering their toys around the office and sleeping 7 out of 8 work hours. Contact us to learn more about the services Weatherly Painting can offer you!